The bumble bee has always been perceived as a friendly bug and has even become one of the most favourite icon in kids' drawings. As its original name "humble bee" implies, the bumble bee is gentle and slow, much less aggressive than its relative -- honey bees, has thin wings, two big eyes and three small eyes, and bumbles around with a lazy buzz. Mostly black and yellow striped and about the size of a jelly bean, these bees are robust-looking, round and hairy unlike the wasp shaped honey bees. Most people cannot tell the difference between the bumble bee and carpenter bee when they spot round bees buzzing around their home. Bumble bees have a fuzzy abdomen, whereas carpenter bees has a shiny abdomen. The former rarely are a nuisance or pose a threat when in close proximity to humans as they will usually go out of their way to avoid human contact. Most of the time they will flee away from danger but will sting to defend themselves if they sense they are cornered and cannot escape, and under great duress. Unlike many other stingling insects including the honey bees, bumble bees do not lose their sting and die after stinging. Bumblebees are typically found in higher latitudes that range from warm to cold climates due to their special ability to regulate their body temperature. Like the honey bee, they are considered very important pollinators of flowers of many plant species and they live in a colony. 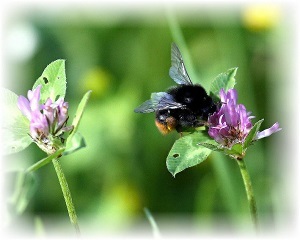 There are over 200 types of bumblebees in the world, with each species having its own preference to types of nectar and prefering different flowers. They gather pollen to feed its young, and search for places to start new colonies. Their colony grows larger over the summer and is commonly found in the garden. The worker bees collect pollen and nectar from the flowers and help defend the colony. They then emerge about 21 days after the queen bee lays her eggs. While they are normally found in flowering plants and don't make holes or tunnels in wood, they will nest under piles of grass clippings or leaves, stones, and logs. A queen bumblebee makes a new nest each year. Their nests are small compared to those of honey bees, with each containing only a few hundred individuals. Bumble bees have very few predators, of which skunks are their largest and most destructive predator. To help themselves to their these bees, skunks are able to tolerate the pain of multiple bee stings. Bumble bees costumes are a sure hit with kids. For ideas, refer to Bumble Bee Costumes for Your Little Ones. In vivid contrast against the gentle bummblebee is the Aggressive Africanised Honey Bee. Find out why they are so feared. End of 'The Gentle Bumble Bee'. Back to 'Amazing Honey Bee Facts'.